Modern front-end development is a mess of competing frameworks, task runners and build systems that may just have you running back to the safety of ASP.NET and Visual Studio before you’ve even begun. With Angular 1, you could take your existing ASP.NET web application, add a few script references and get on with adding some SPA goodness to your site. Angular 2 changes all that, there is an entire ecosystem that you need to get up and running. You’ll be faced with setting up Grunt/Gulp or WebPack, NodeJS, Typescript and making it all work together before you can even think about writing “Hello World”. Ignoring the obvious debate about the merits of this approach and whether all this complexity is really worth it (that’s a conversation for another day) you’re left wondering if there’s any way to test out Angular 2 and build something without learning every nuance of Node, WebPack or anything else deemed necessary by the Angular gods (AKA Google). Before you run screaming back to the (relative) safety of Visual Studio. Here’s another option. If you’re using Visual Studio 2017, check out an alternative way of creating your project using the dotnet new command. If you’re using Visual Studio 2015 then you can take a shortcut by using the ASP.NET Core template pack. The pack includes a template for creating an Angular 2 with .NET Core project which will have you at “Hello World” in a few clicks. That’s not to say you won’t need to learn all about WebPack and Node Modules at some point in the future, but you don’t need to derail your learning by getting all that set up from day one. Make sure you have the following prerequisites installed. Visual Studio 2015 Update 3 – Update 3 is required. .NET Core Tooling Preview 2 or later (.NET Core Runtime 1.0.x and 1.1.0 are supported). Then grab and install the templates. 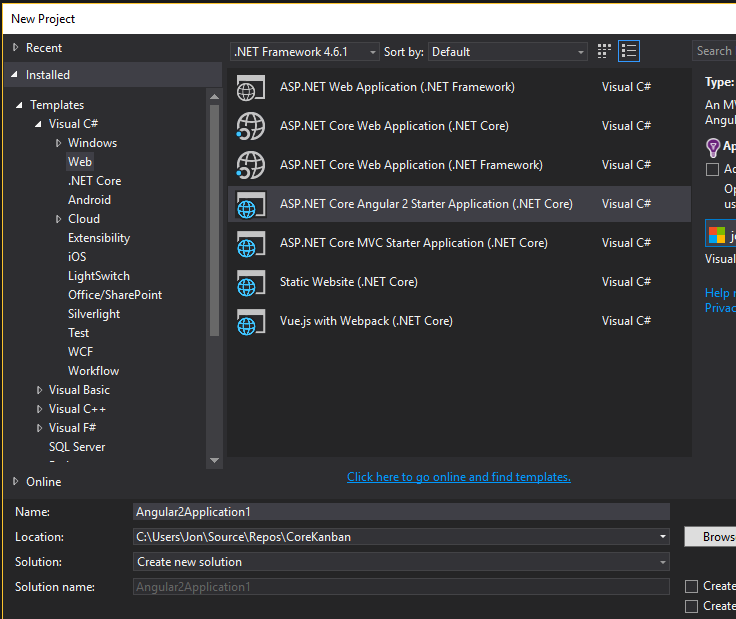 Download the ASP.NET Core Template Pack. For more detailed background information about the template pack (and a few gotchas you might run into), check out Steve Sanderson’s announcement post. Phew, that’s still a lot of prerequisites and dependencies but now you can sit back, relax, and let the template set up your shiny new web application for you. Open up Visual Studio and create a new project. You should find some new templates available under “Web”. 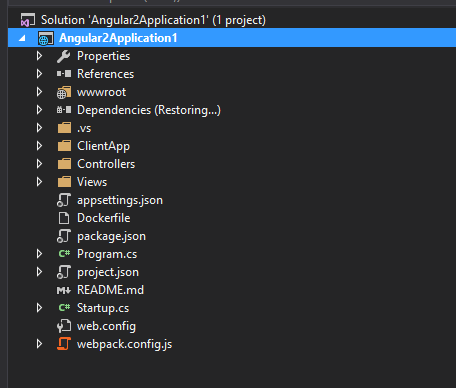 Choose ASP.NET Core Angular 2 Starter Application (.NET Core) and fill out the usual details (name, location etc). Once Visual Studio’s finished, you’ll see something like this. Before we go into the details, hit CTRL-F5 to preview your app. So you did it, you got to Hello World without having to manually set up WebPack with Angular 2 and Typescript. But what can you do now? In the next post we’ll explore the solution and add our first component.